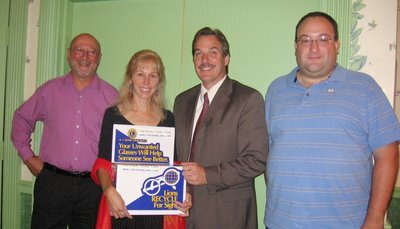 At our September 21st meeting the Horsham Lions hosted members of VOSH-PA. Volunteer Optometric Services to Humanity is an international organization whose goal is to provide vision care worldwide to those who can neither afford nor obtain such care. The VOSH-PA chapter was founded by several local optometrists, in an effort to do their part to address blindness. Three members of VOSH-PA visited us. The members make trips several times a year to places like Guatemala and Haiti to deliver eye-care and glasses to the needy. The trips are funded out of the pockets of the members themselves, all hotel and airfare is the responsibility of the member. While on a mission, the members give eye exams, perform cataract surgery, and distribute eyeglasses to locals with vision problems. District 14-R donates thousands of pairs of eyeglasses to VOSH yearly. Chris Wurst (left) is a local Hatboro business owner. He lends his time and effort to the cause, and stores the VOSH-PA equipment and eyeglasses in his Hatboro warehouse. He also assists the physicians during the trips. Christine Smith (middle) is an optometrist in Doylestown. David McPhillips (right) is also an optometrist, located in Horsham. Christine gave us a slide presentation containing many photos taken during VOSH visits to needy villages. The photos showed how communities for miles around send people to the temporary vision centers for care. Pictures of young children, able to see clearly for the first time after receiving donated eyewear, were stirring and inspiring. We also learned that VOSH collects donated baseball hats in addition to glasses. The hats help shield the eyes of those living in the lower latitudes, where the suns rays can damage eyesight much more quickly than they can more northward. The Horsham Lions gave 220 pairs of eyeglasses to VOSH-PA during their visit. Many of these will be going with the team as they visit Haiti in several weeks.